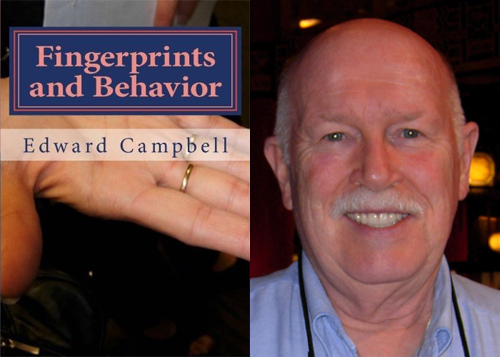 On february 8, 2012 Ed Campbell has presented a new book, titled: 'Fingerprints and Behavior - A Text on Fingerprints and Behavioral Corespondences'. The book is now available at CreateSpace.com (also available at: Amazon.com). and referenced work is the new primer for these fields." Have you seen this book. If so can you tell me how big the print is. I think there is no need to worry about the size of the letter type because the dimensions of Ed's new book are within the normal range - quote: "Product Dimensions: 10 x 7 x 0.6 inches". PS. Maybe your problem with the the other book that you bought resulted from it's dimensions, because I just discovered that Ed's first book is also available as a smaller version for the paperback edition - featured with the dimensions:7 x 6.1 x 1.2 inches, featured with 312 pages. Maybe you were last year just unlucky by buying the smallest edition....? Jeanette, I hope these details make sense for you? Okay Jeanette, thank you for your feedback. PS. Today $17 95 = 11.38 British pounds. I have ordered it, but the delivery date is the 19th March. I think it is coming from America. One Tazman wrote at http://clpex.com/phpBB/viewtopic.php?f=2&t=1772 as mentioned below. “The fact that Mr. Campbell has hijacked the word "dermatoglyphics" is an abomination. Dermatoglyphics is the study of fingerprint patterns as related to other physical characteristics and it is meant as a group study, not an individual study. So, for example, when one reads of a study linking breast cancer in women to high ridge counts in the thumbs, that does not mean that a woman with high ridge counts in the thumbs will automatically get breast cancer. It means that the predisposition to breast cancer was in place in the embryo as the volar pads were present and the ridges were forming. There may be a common genetic cause, but no cause and effect relationship is proven. And just as an arch pattern at the scene of a burglary does not imply that a person with Down's syndrome committed the burglary, a high ridge count in a woman's thumb does not imply breast cancer. That fact that this moron Campbell equates fingerprint patterns with skill at throwing a basketball, striking a golf ball, or even telling the truth proves to me that he wouldn't understand the science of dermatoglyphics if it jumped up and poked him in the eye with an index finger having an accidental whorl. He is a charlatan of the worst cloth, misusing a valid scientific term to try and disguise his lies with a veneer of legitimacy. This is very strong reaction on his recent book. Wow Sethi that's a very mean spirited comment from a member of the Latent Print Examiners forum. It's difficult to take the poster seriously when he uses adjectives like "moron" to describe Ed. It is obvious that the commenter hasn't even read this book unless he had one rush delivered and sped read it. He's basing his comment on what looks like his misunderstanding of Ed's description. Ed says he "argues" certain points and presents "hypotheses". He's doesn't appear to make absolute claims or refer to any data to support anything in this description. Patti wrote: Wow Sethi that's a very mean spirited comment from a member of the Latent Print Examiners forum. Hmmm... obviously, Ed tried to present a provocative book - because he writes about his book: "This book is certain to raise controversy throughout professional and academic circles..."
However, I think I can understand (at least partly) the resistance evoked by certain (rethorical) examples that Ed started using many years ago... just like I have doubts about Ed's efforts to build a bridge between the field of (traditional) 'hand analysis' & biometry. Nevertheless, I have not yet been able to study how Ed has substantiated these examples inside his book... so for the moment I am looking forward to be able to study the details inside his book in the near future. As I said, I ordered this book and the delivery date was given as the 19th March. Well it arrived today 20th Feb. I haven't had time to start it yet, but the first encouraging thing is that the print is a good size. jeanette wrote: As I said, I ordered this book and the delivery date was given as the 19th March. Well it arrived today 20th Feb. I haven't had time to start it yet, but the first encouraging thing is that the print is a good size. I have spent most of the afternoon with Mr Campbell's book. I think it could have been a book of no more than 100pages at the most. The early part consists of other peoples findings and opinions, examples of their fingerprint classifications and lists of books and references which I think should have been at the back of the book and I kept thinking when am I getting to his discoveries and findings. The first off putting thing I did not like was when he gave his opinion on anti abortionists and said they were hypocrits and, for whatever reason, felt it necessary to tell us he was of wasp mode. The book has 264 pages and eventually on page 156 we get to his ideas. I did find that very interesting, especially the clock interpretation, but unlike Richard Unger there was no collective guidance. I would not advise anybody to buy this book. There are about 30 pages of the clock interpretation and, the people who know how to do this, can post it on the forum. I am looking forward to hearing others opinions on reading it. Thanks Jeanette! I think you may be among the first of us to even hear about this clock theory/method/idea? What can you tell us about it from what you've read? Since you suggest that more than the first half of the book is sort of a recap of other people's concepts/viewpoint/results, do you think that might be for people who might not be familiar with psychological interpretations of dermatoglyphics? I think he is marketing this book as biometrics. Does the book list somewhere on the cover/spine, first pages what category it is listed under? Sometimes it is located near the price. Such as Psychology, New Age, Science, Fiction, Non-Fiction.... etc. You ask are these references for people who are not familiar with the fingerprints, not using your big words, probably yes but he did this in his other book The Encyclopidia of Palmistry and it does not come across well. Take into consideration the learner and, I honestly cannot think of an exception, where the writers don't give great encouragement and do refer to others but not in the detail Mr Campbell does which gives the impression, to me,of a don't blame me attitude. The clock theory is imagining a clock and eg the tented arch which goes straight up to midnight is a thoroughly honest person. Take the loop which rises right up and that would also be an honest person, if it goes to eleven o'clock they will be generally truthful except where this may hurt someone else that they know such as their feelings. These people can tell white lies and are Kindly Honest.10 o'clock will be as honest as expected in the business or diplomatic affairs and are Commercially Honest.. If a risk taker will run a bluff in a poker game. Will protect trade secrets. Caveat Emptor. Get a signed contract and written guarantees. 9 o'clock is honesty when it suits the subject. Note we find the clock by the final extent of the loop which is parallel to the tip of the finger and distal phalange crease and this is Conveniently Honest. This is very interesting, I think, but it is just stated findings or facts and I think where do we go with it. I, when looking for what Patti asked for, see it says that you cannot copy anything from the book to post anywhere. Another thing I don't like is there are no great explanations, like his other book, eg what is the point of ridge countings. What does that indicate. Thanks Jeanette, I think I understand what you mean now about how the early part was written. Thanks also for sharing some thoughts about the clock comparison and honesty. Thanks Jeanette for sharing with us your impressions. I am removing this post because I think, maybe quoting from books is not allowed. I don't know, but from recent information this might be the case and also no response. As they say actions speak louder than words. jeanette wrote: I am removing this post because I think, maybe quoting from books is not allowed. I don't know, but from recent information this might be the case and also no response. As they say actions speak louder than words. In general it's all right to quote from books when it concerns only a relatively small part featured with a reference to the book (including page number, etc). PS. Recently Lynn took the initiative to start a discussion about when & how to quote because one of our members had started quoting large parts from many books as - often without any purpose for discussion & often without a clear reference to the original source. Also another member had presented quite a few quotes from his own notes which he had taken from books... but he was no longer aware which of his words were his own words and which of his words where taken from books/websites. However, I have the impression that your goal with quoting from Ed's new book would have appropriate to substantiate your feedback about the book. And therefore I would welcome you to present the quote(s) that your had in mind! jeanette wrote: I have spent most of the afternoon with Mr Campbell's book. I think it could have been a book of no more than 100pages at the most. The early part consists of other peoples findings and opinions, examples of their fingerprint classifications and lists of books and references which I think should have been at the back of the book and I kept thinking when am I getting to his discoveries and findings. The first off putting thing I did not like was when he gave his opinion on anti abortionists and said they were hypocrits and, for whatever reason, felt it necessary to tell us he was of wasp mode. The book has 264 pages and eventually on page 156 we get to his ideas. Regarding your first comment about "100 pages at the most", now that I have the book lying in front of me I understand your observation... though I think it would have been more accurate if you had given an estimate of about 200 pages. My own observation regarding this aspect is that while Ed's book has 265 pages, the letter size of the first 5 chapters (pages 1 to 118) is large - though should be recognized/described as: 'within the range of normal'. However, I have to agree with you that in the 2nd part of his book - chapter 5 to 8 (pages 119 to 226) is presented in unusually large letter size - though many pages include large illustrations that cover the full page. Myself, I was at first sight slightly disappointed with the poor quality of a large part of the illustrations (though quite some of the illustrations have a fine quality)... though for me it is hardly a big deal because I have no problem to recognize the essentials in nearly all illustrations. But I fear that less experienced readers could easily get frustrated with the poor quality of quite some of the illustrations - which appears to be the result of using a rather old scanner which made many pictures look like they were made at a time when scanners were not able to produce much better pictures. Despite that I can confirm that Ed's book has some problematic aspects regarding the quality of the images... I also would like to add here that Ed has successfully managed to present a fascinating book featured with very interesting & detailed content of which a significant part is not available on the internet and/or not available in other books. 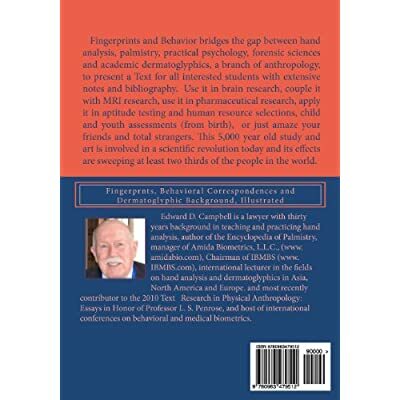 Though some parts of his book are based on info that was presented in scientific publications & books that were recently presented in the field of hand reading - including the works of the authors: Richard Unger, Ronelle Coburn & Jennifer Hirsch, who's books are focussed on the psychological/spiritual interpretation of fingerprints. My conclusion is therefore that Ed's new book has outperformed a large part of the books available in the field of hand reading - and I am quite sure that it will become very usefull for anyone who considers himself/herself as an experienced reader/collector of hand reading books. "The Binding you can blame on Create Space, a division of Aamazon.com. Personally, I flet it was quite adequate for a paper back book. I could have gone for a professsional text book printer, but few could ahve afforded the book hard bound ast uts wiouykld ghave probeblt ranged over $50.00 per copy." Thanks for your reviews Jeanette and Martijn. I still haven't ordered this book, but I will do! Thanks for the reply. I was going to post again and say I had come to think this was a book for the experienced, but then the experienced did not need all these pages of what I am sure they will be well acquainted with and for the blurred pages I probably would not have understood them if they had been clear anyway, especially with no explanations for them. However, from page 155 I really like it and think the behavioural correspondences for the prints are great and have never read anything as good in any other book. What I was asking about is page 68 paragraph 1 talking about thumb prints and says those with loops together with a transverse creased between the proximal transverse crease and the wrist that runs from the ulnar edge of the hand to the thenar crease on the right hand , and possibly on the left hand at the same level in the centre of the hand touching the thenar crease, will tend to become physically ill at their stomach when pressed into confrontation or arguments. The location of the print on the right or left hand will aid in determining in what activities in life the expected behaviour will more likely manifest. This will also be influenced by the more currently predominant portion of the brain used to control personal relationships and this in itself can often be determined from the hands through a subsequent, pressure sensitivity test. Well, I think I have figured it out. I think he is talking about the Via Lascivia with loops on the thumbs and when he says it will be influenced by the more currently predominant portion of the brain used to control personal relationships, I think that means the heart line. Could you or somebody tell me if I have got this right. What you guys say about Ed Campbells book(s) does not surprise me - he seems fond of writing books that have little original content and are primarily compilations of other people's ideas! I have never thought there was much point to that - all you end up with is an incoherent mass of ideas and a series of apparent contradictions. What's the point??! Well, there is a point.